The state-of-the-art platform from VMEdu is disrupting the Learning Management System (LMS) market. As part of the VMEdu Authorized Content Partner (V.A.C.P.) program, VMEdu is allowing anyone to create and host their courses with zero upfront investment and no requirement for technical expertise. Not just that—it provides content experts with the option of hosting their courses on their own website and provides them with their own high quality mobile app too. 1. 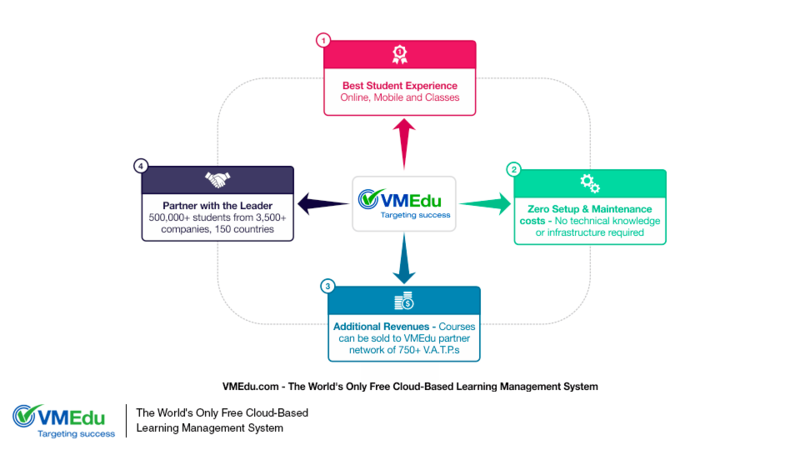 Best Student Experience – Online, Mobile and Classes: VMEdu Cloud Learning Management System (LMS) is, by far, one of the best adult learning platforms globally. It has been built over a period of 7 years, with several millions of dollars of investment – and tested thoroughly by launching multiple courses and websites, which have now become global leaders in their fields. Using the VMEdu LMS allows V.A.C.P.s to offer their courses on their own websites – either online or through their mobile apps. VMEdu also supports physical classroom training options for some high-demand courses. Moreover, VMEdu’s strong back–end capabilities helps its partners easily manage their relationships and training requirements with VMEdu Inc. VMEdu LMS is hosted in a very scalable cloud infrastructure; and already hosts hundreds of courses, with more than 50,000 learning resources including videos, questions, case studies, simulated exams, flashcards, study guides etc. Anyone can join for free and launch their free course in few minutes/hours on their own website. 2. Zero Setup and Maintenance costs – No technical knowledge or infrastructure required: Unlike on other traditional LMS platforms, one does not have to pay any licensing fees, buy expensive hardware, or hire expensive software professionals to launch their online courses and mobile apps. There is no cost associated with creating or uploading the courses. Unlike traditional LMS platforms which usually have negligible support for mobile apps, VMEdu creates the best-in-the-industry mobile apps at zero-cost for Android Phones (if more than 1 hour of video courses uploaded) and $ 250 for IPhone. One can save more than 90% of your current LMS expenses by using VMEdu LMS – and also have significantly more capabilities than those offered by traditional LMS platforms. 3. Additional Revenues – Courses can be sold to VMEdu partner network of 750+ V.A.T.P.s: Courses created by V.A.C.P.s can be made available and sold through VMEdu’s fast-growing partner network of 750+ Authorized Training Partners (A.T.P.s) in 50+ countries. This makes their course available to a huge network of companies, colleges, universities, training companies, and individual trainers/experts. No other traditional LMS platform helps content providers with customer acquisition. 4. Leader in Global Education: VMEdu is a global leader in adult education through its multiple brands and partner eco-system. VMEdu has taught more than 500,000 students from 150 countries and 3,500+ companies; and have a huge A.T.P. partner network of 750+partners in 50+ countries. It is funded by Sequoia Capital which is the leading Private Equity/Venture Capital firm in the Silicon Valley – and has funded innovative global companies such as Apple, Google, Cisco, LinkedIn, Oracle, WhatsApp, etc.